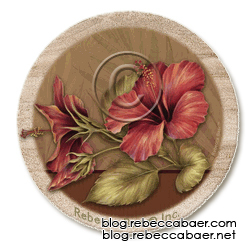 When posting copyrighted artwork on the web you may want to watermark the image to minimize reuse without permission. This can be accomplished by following this simple tutorial. Th add identifying information to your images use my tutorial Adding Identifiers & "©" to Your Images. Begin by creating a new or opening an existing image file. I am starting with an existing file. 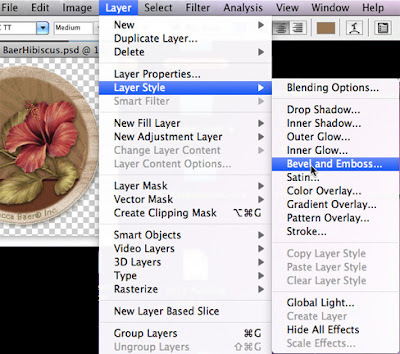 Add a new text layer and type the information for the desired watermark. This image shows the copyright symbol, create this symbol by using the shortcut "command G" (mac) [Fig. 1]. Next, adjust the settings as follows. Depth: 200%, Size: 3 px, Soften: 0, Set the Highlight and Shadow Opacity both to 100%. Then click okay [Fig. 3]. 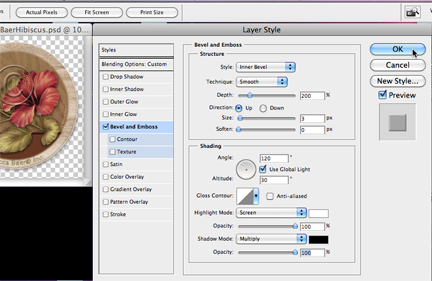 Note: to modify the bevel and emboss settings you need to choose the "Bevel and Emboss" text (highlighted in blue, below) beside the check box in order for the correct window to appear. 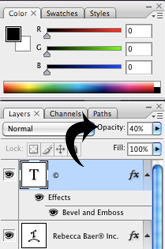 In the layers palette found on the right side of your screen, reduce the opacity of the watermark layer to 40% [Fig. 4]. 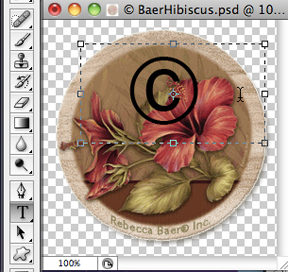 This allows the underlying layer to show through giving your watermark a transparent appearance [Fig. 5].